Drought is again casting a long shadow over many rural communities. People feel powerless as costs mount, stock die or have to be sold and years of experience, investment and care tending of the land become largely irrelevant in the face of challenges to hand. The psychological and financial rewards of harvests become more difficult to visualise. For many in these circumstances the self-esteem that had come from a career dedicated to the land and looking after family evaporates. The despair and despondency this brings diminishes lives, bringing in its wake isolation, depression, increasing rates of domestic violence and suicide. However rural folk are a resilient lot. Experience of overcoming past challenges and the inspiring work of groups like One day closer to rain help people to see the possibility of a life not tainted by drought. 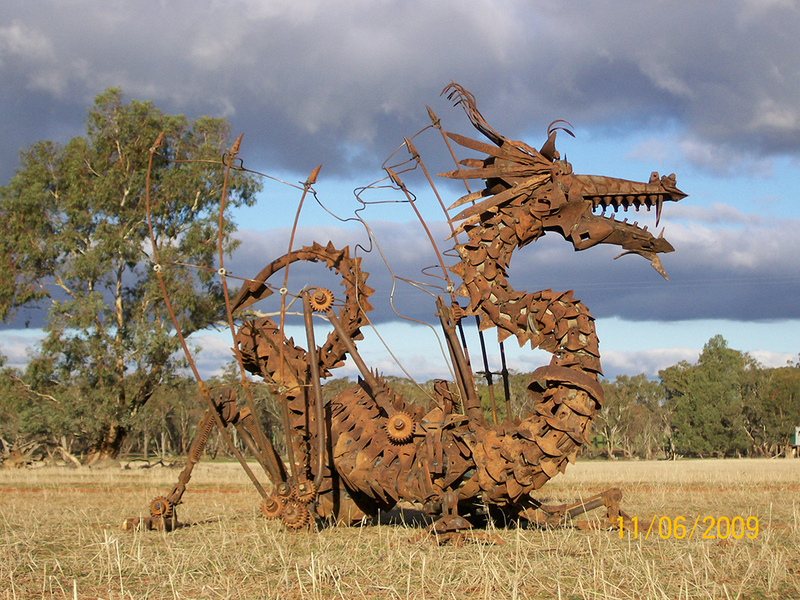 Another inspiring example is provided by the Spirit of the Land Festival in the town of Lockhart in the New South Wales Riverina. The area cultivates cereals and sheep and the town enjoys “a strong community vibe” according to Mandy Strong, Past President of the Festival. She noted, as in many other rural communities around the world, many men found it particularly difficult to ask for help. This emphasised for her the critical role of giving people (particularly men) a renewed sense of purpose. In 2006, during the worst drought in Lockhart’s recorded history, one local woman, Myra Jenkins had the idea to celebrate the innate creativity and craftsmanship of the local farmers as a way of rekindling this sense of purpose. 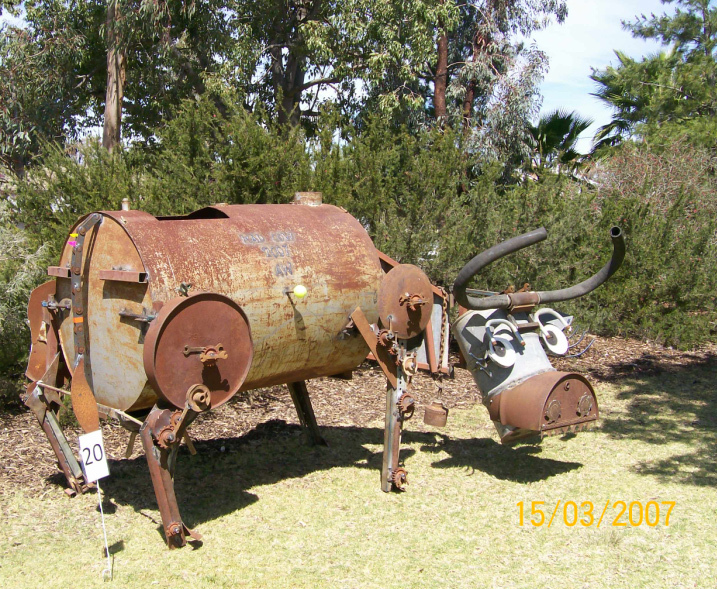 Myra, Mandy and others sought to organise a festival of ‘farm art’ using metal and timber that could be sourced from ‘the tip out the back’ of every farmhouse. 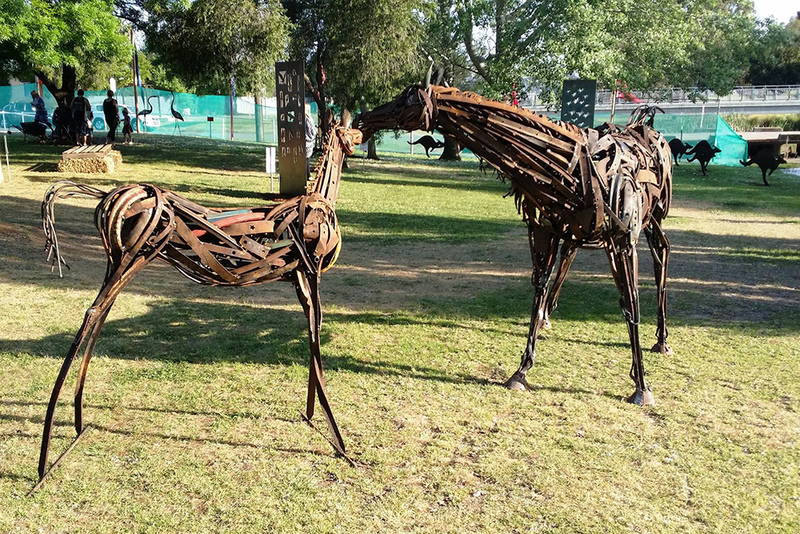 The central focus of the Festival is the public display of sculptures in the town. “It was inspired by those who saw the inner strength, courage and determination of a community battling an invisible foe. From the very first, the Spirit of the Land has proved an outstanding success – reviving community spirit, inspiring enthusiasm and putting a small town well and truly on the Festival map”, Mandy said. The first Festival was in 2007 and has grown every year. Each year prizes are awarded for the best sculpture in a range of categories. 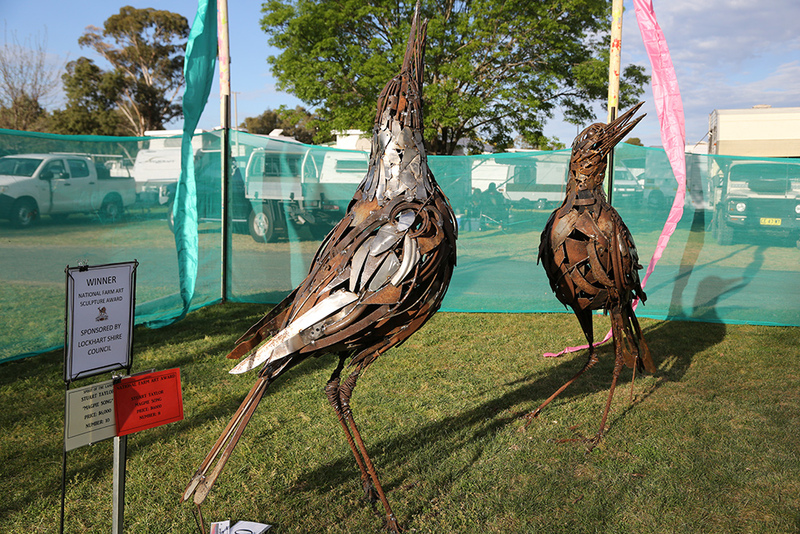 This year’s categories are: National Farm Art Sculpture Award; the Creative Cocky Award; Local Artist Award; Small Sculpture Award; and Youth Award (Under 18). 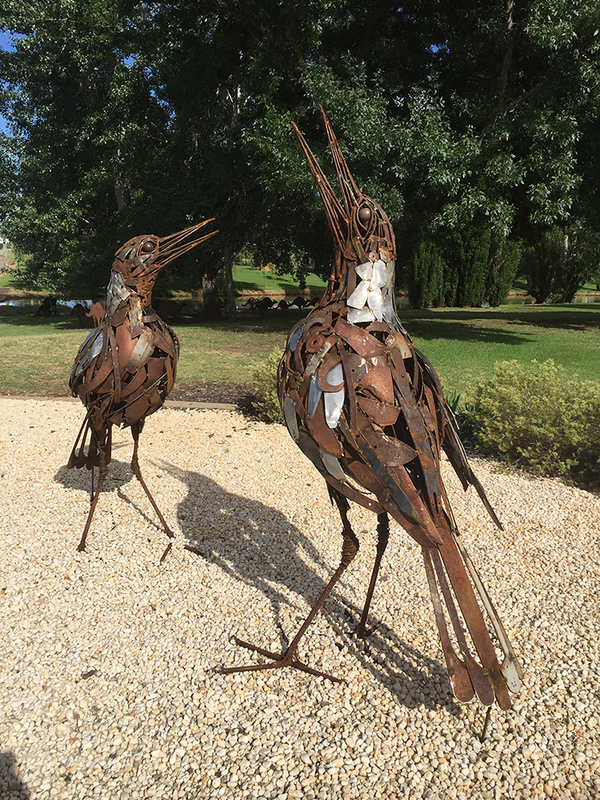 Funding comes from a number of sources, notably the Lockhart Shire Council and the Bendigo Bank, and includes funds to purchase a work for the town’s sculpture park each year. The Festival has seen many local farmers flourish as artists and overcome depression. 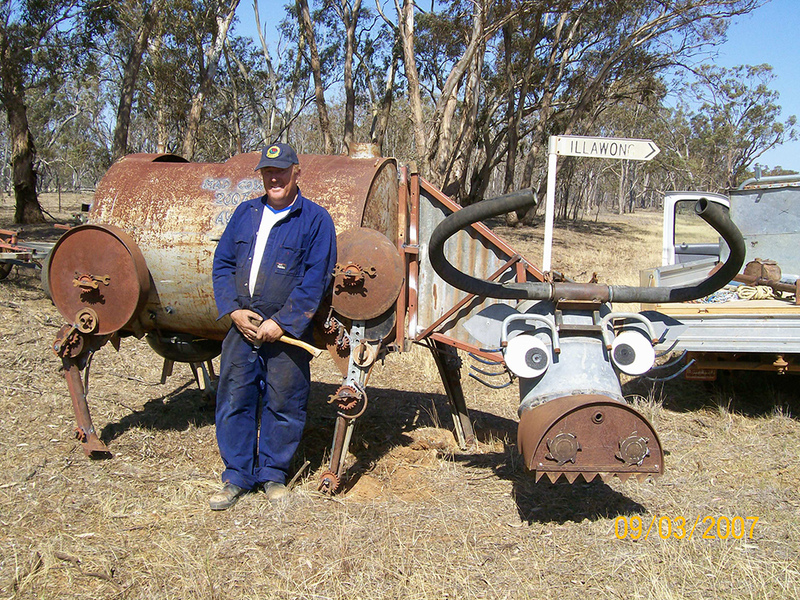 One such farmer is Andrew Whitehead. Andrew told me that finding art saved his life. Although it was not the only thread that he could hold onto in the bleak times the creativity of sculpting and the encouragement of his partner kept him going and enabled him to heal himself. As far as he was concerned the Festival “couldn’t have come at a better time”. As he saw it, the task of creating “a great sculpture is made up of 100 good sculptures”. To him this provided a challenge “that was realistic, achievable and in his control”. He is a multiple winner in the Festival. Although the act of creation has been his main focus he enjoys the delight of the visitors to the festival in his works and his contribution to the townships streetscape. In the Festival’s 12 years it has faced many challenges. It takes a lot to organise and needs a lot of appeal to attract visitors. Mandy told me it demanded a lot of faith that it could happen and significant investment of emotional capital. 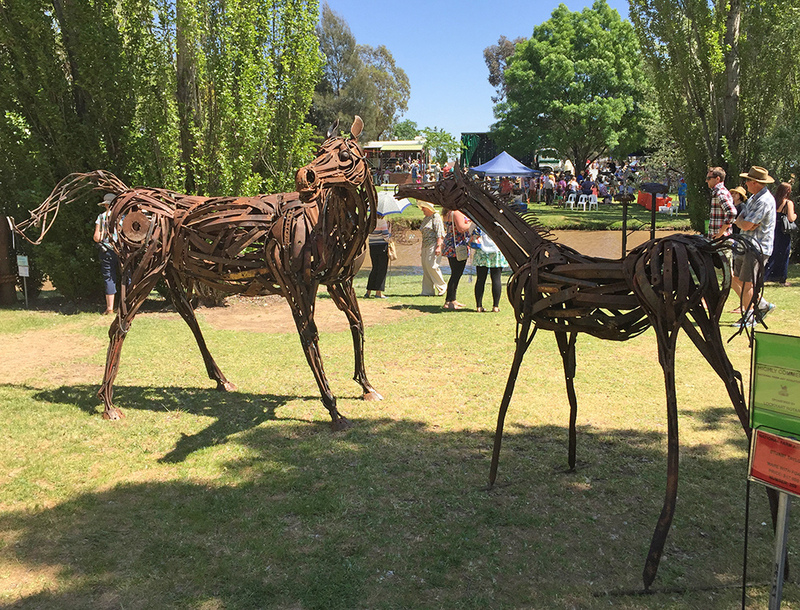 The Spirit of the Land Festival is an inspiring example of how a renewed sense of purpose can come from celebrating people’s connection to the land and showcasing local skills. 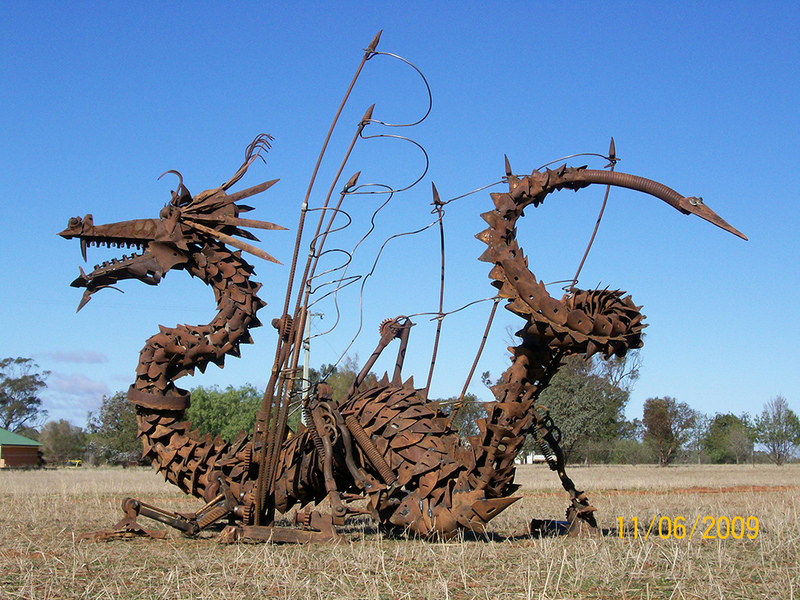 This year’s Spirit of the Land Festival will be held in Lockhart on 13-14 October.